The American Geriatric Society divides the population of people over 65 years of age into 3 groups: ‘young old’ aged 65-74, ‘middle old’ aged 75-84 and ‘old old’ aged more than 85. 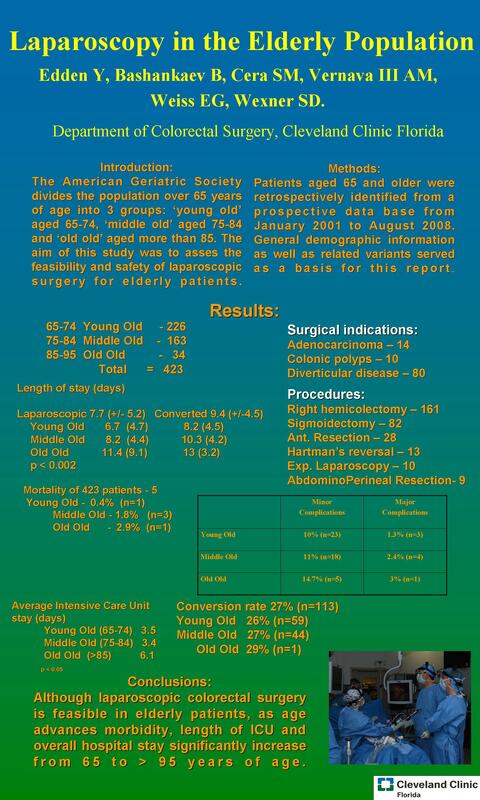 The aim of this study was to asses the feasibility and safety of laparoscopic surgery for elderly patients. Patients aged 65 and older were retrospectively identified from a prospective data base. General demographic information as well as related variants served as a basis for this report. From January 2001 to August 2008, 423 patients aged 65 to 95 years underwent laparoscopic surgery. These patients were divided into 3 groups: 65-74 years of age (n=226), 75-84 years of age (n=163) and ±85 years of age (n=34). Surgical indications included adenocarcinoma (n=149), colonic polyps (n=100), diverticular disease (n=80) and others. Procedures included right hemicolectomy (n=161), sigmoidectomy (n=82), anterior resection (n=28), ileocolic resection (n=14), abdomino-perineal resection (n=9) and others. Procedures were elective in 90.4% (n=382). The average length of hospital stay for the ‘young’, ‘middle’ and ‘old’ groups were 6.7 days, 8.2 days and 11.4 days respectively (p < 0.002 for all groups) and the mortality rates were 0.5% (n=1), 2% (n=3) and 3% (n=1) respectively. The major morbidity rates were 1% (n=3), 2.4% (n=4) and 3% (n=1) respectively. The length of ICU admission was 3.5 days for the ‘young’ group and 7 days for the ‘old’ group (p =0.05). Although laparoscopic colorectal surgery is feasible in elderly patients, as age advances morbidity, length of ICU and overall hospital stay significantly increase from 65 to > 85 years of age.